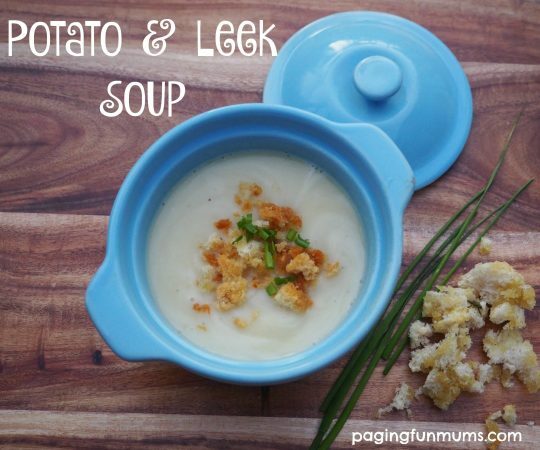 This Creamy Potato and Leek Soup recipe will satisfy the whole family! Leek has always been a big hit in our house so it was only a matter of time before we created our own tasty soup. I didn’t follow a recipe but rather just included the simple flavours that my family enjoys. Step 1 – Place the oil and butter into a large pot over medium/high heat and allow butter to melt before adding the leek and garlic. Step 2 – Reduce the heat to medium/low and slowly sautee the leek and garlic. Step 3 – Increase the heat to medium and add the potato, chicken stock, water and simmer gently (with the lid half on) for 25mins. Step 4 – Blitz with half a cup of cream until smooth and serve with some finely chopped chives. We served ours with some fresh croutons – simply tear up some stale sour dough, drizzle with olive oil and sprinkle with fresh chopped rosemary, salt and pepper! Yummy!! I hope you enjoy this recipe as much as my family do. You might also enjoy the dinner recipes found here.